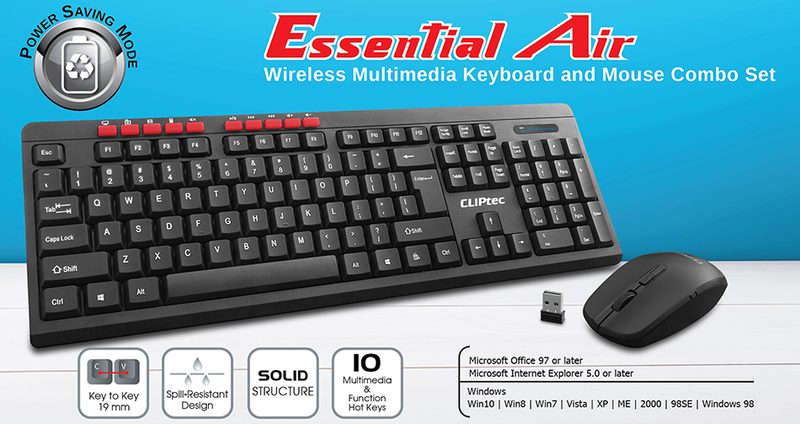 The CLiPtec RZK339 Wireless Multimedia Keyboard and Mouse Combo Set 'Essential Air' is a practical combination of wireless keyboard and wireless mouse. It redefines the meaning of combining style and simplicity. The anti-interference function offers reliable 2.4GHz transmission and longer operational distance. 10 extra multimedia and function hot keys are all there ready for your one-quick application launching command. This keyboard provides low profile keys with comfortable stroke for a great typing experience and extremely comfortable and contains a 19mm Key pitch. 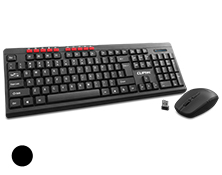 Solid keyboard and keycap construction with long lasting coated key printing.The full size profile wireless mouse with changeable between 1000/1200 and 1600DPI optical that provide great working efficiency and performance. Low profile and compact layout with comfortable stroke for a great typing experience. 4 Function Hot-Keys: My Computer, Favorites, Email and Calculator. You'll experience virtually no signal loss up to 10 meters away with advanced 2.4GHz connectivity. Solid keyboard and keycap construction with long lasting coated key printing. You'll be moving along smoothly with a precise, high-defition optical mouse to help you get around. Optimum profile size and unique surface design for maximum comfort. Built-in intelligent power management chipset for battery power saving with auto sleep function. Low voltage indicator function can remind you to replace battery in time.